Curl up with your favourite book and a mug of coffee in one of our super-cosy fabric armchairs, built with solid hardwood and upholstered in premium fabric. Whether purchased as a standalone piece to complete your home, or as part of a matching set, our collection of fabric armchairs makes a stylish statement. With their plump, foam- and fibre-filled cushions and luxuriously padded arms, our fabric armchairs offer a cocoon-like retreat that’s perfect for taking a nap or curling up with a good book. Built using solid hardwood frames and cushions that perfectly balance firm with plump, each one is built to stand the test of time and help you take pride in your living space for many years to come. 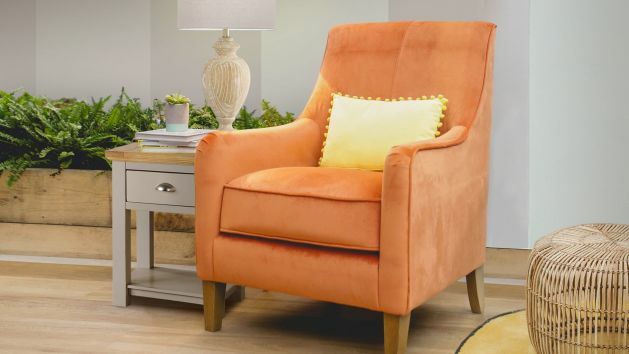 With so many designs and attractive shades, there’s a fabric armchair for your home, no matter how eclectic your style is. The stylish Jasmine bamboo slate fabric armchair will brighten up any room, whether paired with matching furniture or as a standalone piece, and comes in sumptuous shades including jade, apple, spice, and duck egg. We also offer our distinctive and very popular velvet armchairs. Velvet is a type of woven tufted fabric in which the cut threads are evenly distributed, with a short dense pile, giving it a distinctive soft feel. By extension, the word velvety means "smooth like velvet." If you're after armchairs that are as stylish as they are smooth, have a look at some of our stunning velvet armchairs, like the gorgeous Sydney velvet armchair in cerulean blue. All our Jasmine plain fabric armchairs make an elegant addition to your living room, and look great alongside a matching sofa. If you regularly host overnight guests but struggle for room, the Jasmine range even boasts an armchair armchair sofa bed. Every Oak Furniture Land purchase qualifies for free delivery and our fabric armchairs aren't an exception. We’ll even call you half an hour before we arrive to let you know we’re almost there, before delivering your furniture to the room of your choice. Good-quality furniture should be an investment, and our Furniture Guard Cover protects your item for five years and costs as little as £29.99.